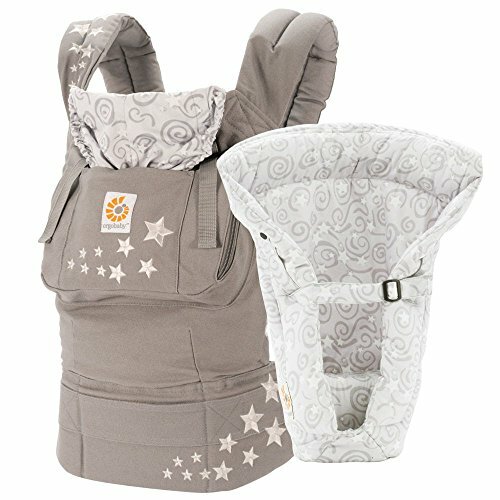 The Ergobaby Original 3 Position Bundle of Joy in Galaxy Grey pairs our award-winning carrier with the new Easy Snug Infant Insert for a cozy transition to the world from the womb. The Original line offers our renowned comfort for parents, while providing the ergonomics your baby needs from newborn (min 7lbs. with infant insert). Its supportive Infant Insert (7-12 lbs.) mimics the soothing feeling of the womb and its wide deep seat supports baby in a spread-squat "M-shape" position up to toddler. Enjoy the convenience of a front and back carrier, along with a hip carry option, while allowing baby to face you at all times. With a classic light grey shell brightened up with bursts of star embroidery and its matching cosmic swirl lining, the Galaxy Grey Bundle of Joy is a popular favorite, making it the perfect gift for new parents.